Grace Hitchcock is the author of three novellas in The Second Chance Brides, The Southern Belle Brides, and the Thimbles and Threads collections with Barbour Publishing. The White City is her debut novel and releases March 2019 with Barbour Publishing. She holds a Masters in Creative Writing and a Bachelor of Arts in English with a minor in History. Grace lives in southern Louisiana with her husband, Dakota, and son. Visit Grace online at GraceHitchcock.com. True, riveting stories of American criminal activity are explored through 6 unique stories of historical romantic suspense in the exciting new True Colors series. In book one, The White City, Winnifred Wylde believes she witnessed a woman being kidnapped while attending the Chicago World’s Fair in 1893. She tries to convince her father, an inspector with the Chicago police, to look into reports of mysterious disappearances around the White City. Inspector Wylde tries to dismiss her claims as exaggeration of an overactive imagination, but he eventually concedes to letting her go undercover as secretary to the man in question—if she takes her pistol for protection and Jude Thorpe, a detective, for bodyguard. While Winnifred Wylde is a fictional character, Doctor H. H. Holmes was very real and became infamously known as America’s first serial killer. Learn more about him HERE. To celebrate her tour, Grace is giving away a grand prize of a $25 Amazon gift card and a copy of The White City!! This wasn’t quite what I was expecting but I still enjoyed the read. It was a bit lighter than I was anticipating, but still an interesting read none-the-less. Winnie is a spunky character and nothing gets in her way when she sets her mind to something. Jude is a dashing and strong hero and I was rooting for him. But there is an added element that had me wondering where this story was going to go and what part this other person played in the overall story. This read more like a light mystery. Jo Anderson shares hazelnut coffee creamer, sending a woman into anaphylaxis shock. This is a collection of cute, cozy mysteries all tied together with the ladies in the coffee club. Of course there are some stories I liked better then others, just different writing styles. But if you enjoy a light-hearted mystery this collection would be up your alley. Embark on a seafaring adventure in a brand-new series from bestselling author MaryLu Tyndall. After witnessing the death and destruction caused by the Civil War, Colonel Blake Wallace is eager to leave his once precious Southern homeland for the pristine shores of Brazil and the prospect of a new utopian community. Widow Eliza Crawford seeks passage on Wallace’s ship harboring a dirty secret—and a blossoming hope for a fresh start. But will dangers from the sea and from man keep them from the peace and love they long for? This is the second book I have read by MaryLu Tyndall. The first was Veil of Pearls, which I absolutely loved, probably the best book I read in 2012. So I had high expectations for Forsaken Dreams. MaryLu paints a vivid picture of the scenes and characters. At first the two main characters where a little too sweet on each other, it all seemed too perfect, which it was until the conflict arises. Then we get to the good stuff. All the characters seem to have gotten on the ship, New Hope, to escape their past. But they soon learn you can’t outrun your past, it will catch up with you. Now they are forced to face it and reconcile their future with their past. Can’t we all relate? Don’t we all wish there were things we could forget about, but the truth is our past has shaped us into the people we are now. That same holds true for this cast of characters MaryLu introduces us to. The past can also be redeemed, but only with the help of our Savior, the Redeemer. Not only are the main characters endearing that whole cast has a story. 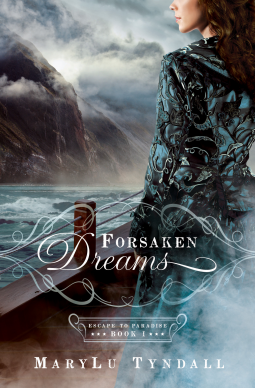 You will get bits and pieces of their story as your read Forsaken Dreams and it will made you want to read the rest of the series. I can’t wait to read the next (whenever that will be) and see what secrets the other characters are hiding. Oh, and there are some mysterious things taking place as well. But you will have to read the book to find out what I am talking about. To order the book on Amazon click here. To order from Barnes and Noble click here. To order from Christianbook.com click here. To order from Barbour Publishing click here. To check out MaryLu’s website click here. An egalley of this book was given to me by Netgalley.com in exchange for an honest review.